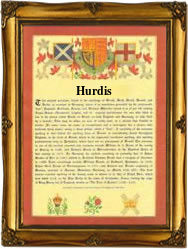 Recorded in several spellings including Herd, Hurd, Hurde, Hurdman, and the patronymics or diminiutives Hurdis, Hurdiss and Herdson, this is an English surname. It is one of the occupational names for a keeper of animals, generally cows or sheep. The derivation is from the pre 7th Century Olde English word 'hierde' meaning a herd or flock. Occupational surnames were amongst the earliest to be created, but often they did not become hereditary unless a son or sometimes a grandson, followed in the footsteps of the father. In this case early examples of the surname recordings taken from surviving rolls and registers of the medieval period include those of: Thomas Hord of the county of Staffordshire in the year 1221, Reginald Le Herd of Somerset in 1243, and Richard Le Hurde of Sussex, in the subsidy rolls of that county for 1296. Robert Herdsman is recorded in Colchester in 1367 and Nicholas Herder in Somerset slightly earlier in 1333. Later examples include Ellen Hurdis, the daughter of Thomas Hurdis, who was christened at St Brides church, Fleet Street, in the city of London on March 20th 1598, and Katherine Hurdiss, the daughter of William, who was christened at St Olave's church, Hart Street, also in the city of London, on July 12th 1697. The first recorded spelling of the family name may be that of William Le Hird. This was dated 1189, in the Curia Regis rolls, during the reign of King Richard 1st of England and known as "The Lionheart", 1189 - 1199. Throughout the centuries, surnames in every country have continued to "develop" often leading to astonishing variants of the original spelling.